Belle City Amusments will be back this year to provide exciting amusement for thrill seekers of all ages. Come Ride one of there premium rides: The Rock and Roll Musik Express! Built by Bertazzon of Italy, the Rock and Roll Musik Express is a full sized Himalaya style ride that can accommodate up to 60 riders per ride cycle! 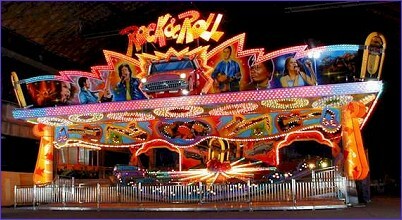 The Rock and Roll is transported on two semi trailers and takes approximately 8 hours to set up. At night time, the ride comes alive with its spectacular computerized light show, as well as strobe lights, and fog!